This is a really cool film. Really well done, too. There were lots of shots that I would've been fooled into thinking they were from the 20s if I had seen them out of context. It has a pretty decent Orwellian story. There was some symbolism that was a bit too obvious, and some parts of the story didn't make complete sense. Still, it's a gorgeous-looking movie, and I really liked the music and the clever use of subtitles. I totally recommend it. Bizarre retro-futurist sci-fi done in the style of a silent film. The technique is brilliant but the story couldn't hold my attention. It looks magnificent, I am really, hats off. Absolutely delightful and creative use of words on screen, marvelous editing. I don't fully appreciate the heavy religious/WW2 symbolism, but it doesn't hurt the film too severely. Esteban Sapir created a fascinating movie that's really hard to discribe. The look reminds me a bit of the early Fritz Lang Movies. Some parallels to the silent movies are distinctive, too. 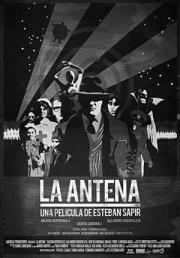 At least "La Antena" is artfully, beautiful and really pretty to watch. I loved some of the style elements. Especially the use of text. Budgetary restrictions are worked around with technical cleverness. If only for that I respect the filmmakers immensely. Homage madness obstructs it from attaining individuality. Quite a piece. Take a deep cooking pot. Put a tablespoon of Maddin's visual style and a pinch of Méliès trickery together. While stirring add a few of Gilliam's quirky TV screens from Brazil and some very obvious Metropolis homage. Keep stirring till boil, then lower the heat and leave it to simmer for 15 minutes. 'La Antena' is what you will get. Somewhat tasty since the ingredients are decent but still not special. Please serve hot. If Georges Méliès would be caught in a magic beam and transported to these times, he would make a movie similar to this one. Magic of silent experimental movies and technology of today makes this little gem an unforgetable expierence. A must see. Top notch editing, cinematography, and art direction, but an over-reliance on gimmicks and extremely heavy-handed symbolism really bog the film down.